WearTheFoxHat had the most liked content! I read a pamphlet at the dentist about how to fill a cavity and have a dremel. Can I practice on your teeth? On a side note Nice to see medals make a return ! We never quote "square foot pricing" We ALWAYS quote time and material for the install and add project related expenses. We cannot do the math for you as we do not know how slow(or fast) you install. Is access equipment rental needed? What about travel / lodging expenses....?? Are you flying, driving or walking to the site? Is a hotel stay required? You need to allow for the client to pay some part or all of this. Have you thought about what profit margin you expect? If a client sent me a list like that I'd ask for elevation drawings and floor plans and if its already built I want photos of the site conditions. Being able to reach the glass standing on the floor is one thing. If this is a curtainwall with the glass stacked it is a very different cost in time. Some sites often have furniture /store displays and other crap in front of the glass. Its not your responsibility to move it but accommodations to work with occupants need to be scheduled. Is this during regular or after hours? Hey could you tint my barn find windows ....??? @Bham Bubbling happens most often when removing premask too early or a bit too much slip in your slip slowing the bond to the glass. The wait for the film to bond to the glass better than the film to premask bond is the hardest part to learn. SOOOO glad for smart phones now!!! When I would do a one off I'd often wait 10-15 or more mins before a test tug on the premask to see how its sticking. 3M has at multiple levels of tack in their premask offerings. SCPM -3 (low) SCPM -2(medium) and SCPM 53 (high) There is also SCPM 44x also a medium tack . 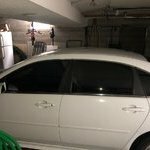 @Tint Eastwood I hope you took that back for a full removal and replacement. That guy needs to learn to shave!